The Government has just announced the final deathly blow to the renewables industry and Britain’s ailing green agenda as they revealed that FiT payments were going to be reduced by as much as 87% from the beginning of next year. The announcement has sent shockwaves through the industry with many prominent supporters coming out to express their disappointment and anger at the decision. The Government released their consultation document on the future of Feed in Tariffs at the end of August. There have been rumblings and rumours over the last few months about what the document was going to contain but everyone was surprised at the severity of the proposed cuts. FiTs basically provide those who have installed renewable technologies such as solar panels with a set rate that the energy companies then pay them for the amount of electricity they produce. It is currently the major driving force for industries such as solar and has been one of the prime reasons that households and businesses have taken up clean energy tech like solar and wind generators. This payment enables the new technologies to compete with existing established fossil fuel heat energy technology and grid supplied electricity, the removal of this essential assistance makes the break even / payback period of the renewable technology almost the same as the lifespan of the system, making the investment untenable. The question many supporters of green technologies are asking is what reason the Government would have for pulling the rug from under the renewables industry at a time when it is beginning to thrive and make a real difference to the energy future of the UK. The Government has already intimated that if this round of cost cutting is not successful, they may have no choice but to close the offer of generation tariffs to new applicants and end FiT altogether. They largely depend on their budget for renewables dictated through the Levy Control Framework and there are big fears that if current spending continues they will far outspend their £7.6bn limit which could cause an increase in energy bills towards the end of the decade. The response from those in and around the renewables industry has been both stark and uncompromising. There is a general feeling that the Government has turned its back on the advance of technologies such as solar and wind energy generation under pressure from the fossil fuel industry and other anti-green lobbyists. The suggestion that this Government is putting their dubious financial and ideological motives ahead of the wellbeing and welfare of the rest of the country has been touted in various circles. 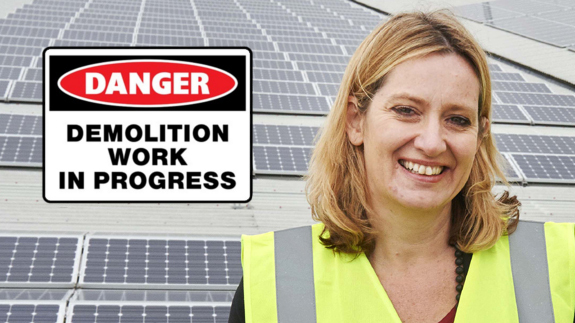 It is all the more worrying after energy secretary Amber Rudd only a year ago hailed the solar industry as one of the big successes in UK business, making a big point of the fact that it had not only provided clean energy for the country but also helped to create over 14,000 jobs. The solar industry is not averse to the idea of operating without subsidies, sensible digression was expected as the technology and industry evolved. Seeing its future as an affordable clean energy, providing the option for co-generation, that is able to thrive without the need for help from the government. However, the severity of the planned cuts have come too soon for an industry that is beginning to make huge advances and provide the UK with a significant level of clean energy and vast carbon reduction. There is no doubt that we may be approaching stormy seas for the renewable energy industry as the Government tries to reduce costs and bring their spending under control. Whilst there may be many who are happy to see us rely on fossil fuels such as gas and oil, develop potential fracking sites and build exorbitantly expensive new nuclear power stations, there are many more who will be worried that we are stopping the green energy industry in its tracks for short sighted and dubious reasons – all for the sake of saving consumers £7 per year on their energy bills! The decimation of an industry that promotes greener, cleaner living is occurring at a harrowing rate directly under everyone’s noses, whilst the Government heavily subsidise the oil, gas, fracking and nuclear industries with tax payer’s money from other sources. To put this in perspective, the subsidies for ALL renewables currently cost £4.3bn per year funded by a small part of the ‘green taxes’ on your energy bill, all totalling approximately 8%. Compare this to the £26bn per year in subsidies for fossil fuels, that’s £400 per year, per household to support the fossil fuel industry, funded by Government through other taxes. It is easy for them to save you money on your energy bills by scrapping renewables, albeit temporarily, this is however a false economy as we will all end up paying for the consequences of this miss-management in the long run. This may end in the UK being beholden to foreign energy companies dictating UK prices with no real renewable energy infrastructure of our own. Read more about the breakdown of Green Taxes here..
Next PostNext Is it Time the People Took Back their Power?